" There is a certain look, indeed, when you look at the hull in profile. We can see a concave in the forward and aft centerline sections the boat, which is the result of the calculations we did with Guillaume and Veronique Soulet. It the logical solution for the pressure distribution required by this kind of boat. That’s nothing new. This is something that we have experimented with in the American Cup, and it was on the AC72 of the New-Zealand team racing in San Francisco. I had proposed an inverted shape on the forward and the aft of the boat which was accepted. Overall, what matters to us is the pressure distribution along the entire hull. We are trying to maximize the sailing waterline length, so the boat sails “as though” it has a longer waterline than it actually has. The bow section has an entry that is quite large and pronounced, and creates a high pressure area early in the hull wave, essentially pushing the bow out of the water a bit. On the other hand, on the aft section, we don’t want very much pressure on it, because that would dig into the water too much and create too much drag… on the transom. This means that the aft and the forward of the boat work together. And, finally the center section; we have learned that volume is more important than the hull shape. So when we apply Archimedes principle, we find that the added volume here displaces a bit more water, maximizing the hull wave length, which lengthens the waterline in the aft section. 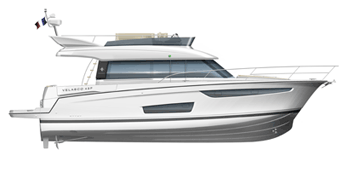 Moving the balance of pressure distribution to the forward part of the hull, instead of the aft, reduces the total displacement, propelling the boat forward. A closer look at the underwater sections of the hull show that we have kept significant rake in the hull, after all these calculations were completed, which for us was a real aligning of the stars. This has kept the water line fairly short, versus the overall hull length. When combined with the high hull volume, this has hit a sweet spot under many rating rules, and is beneficial to performance overall. "